EVGA has built a name for itself inside the community of overclockers, gamers and other enthusiasts. 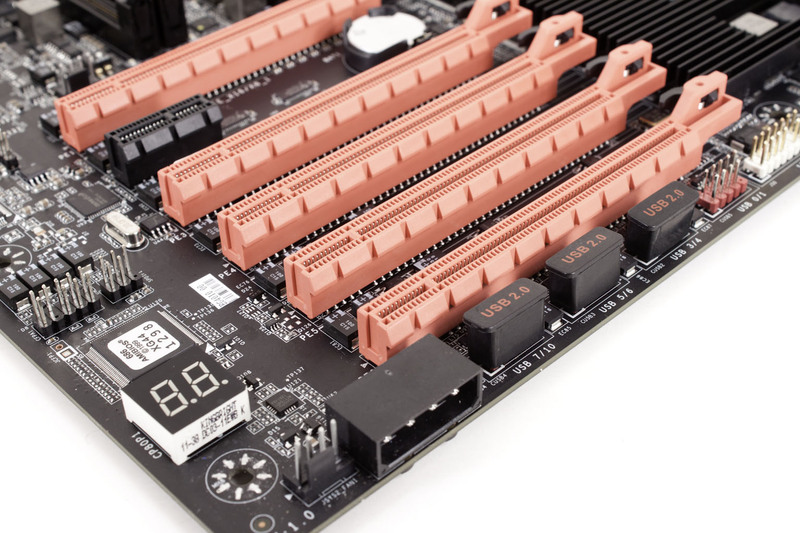 Although they do not have the same volume as Gigabyte or Asus, they still put out some of the top boards when it comes to overclocking and performance. 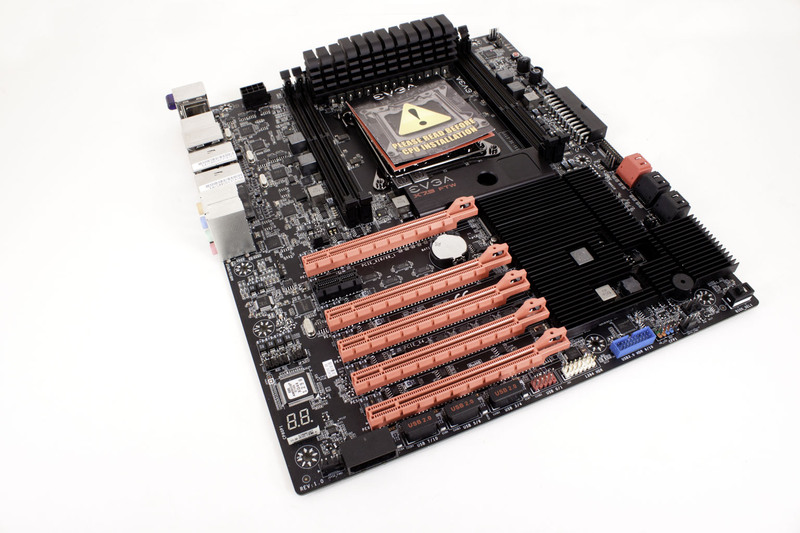 In fact as of this writing an EVGA Classified SR-2 Motherboard holds the number one slot in Futuremark’ s 3DMark 11 Hall of Fame. 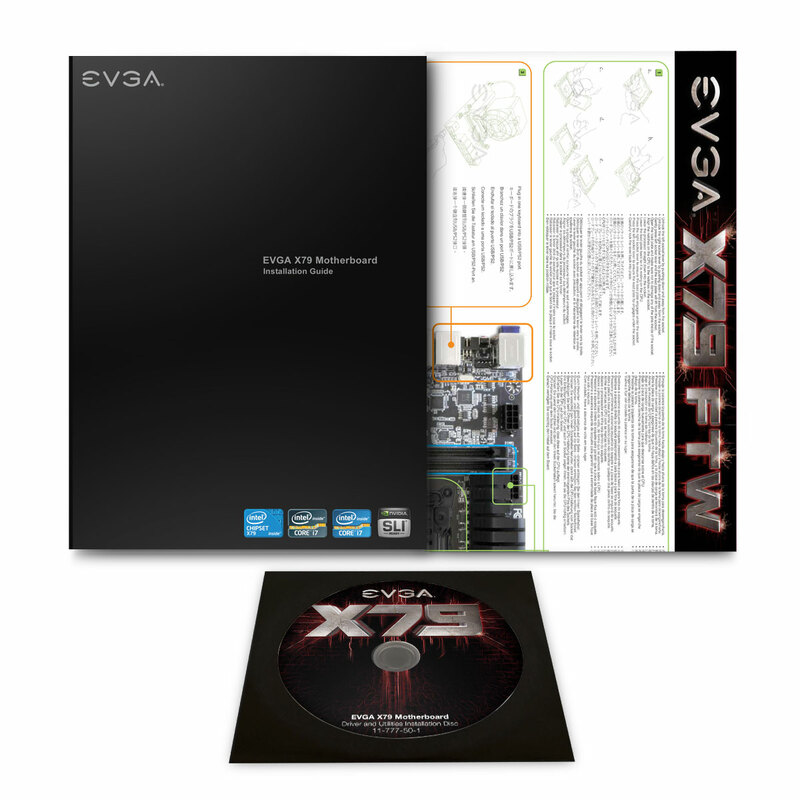 Unfortunately we do not have a Classified SR-2 in the shop for testing, but we do have an EVGA X79 FTW (151-SE-E777). 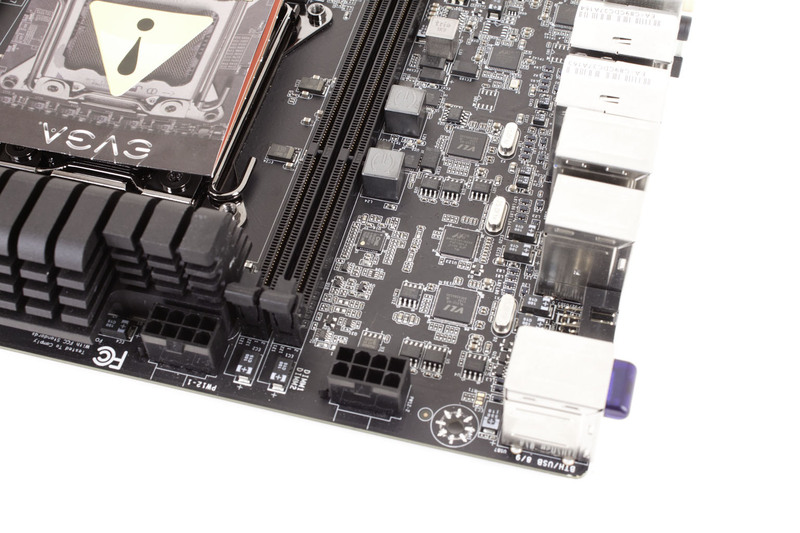 This board features a matte black PCB, five PCI3 x16 slots and a lot more. So let’s take a look over the X79 FTW and check out both the design choices and features you can expect when you buy this board. 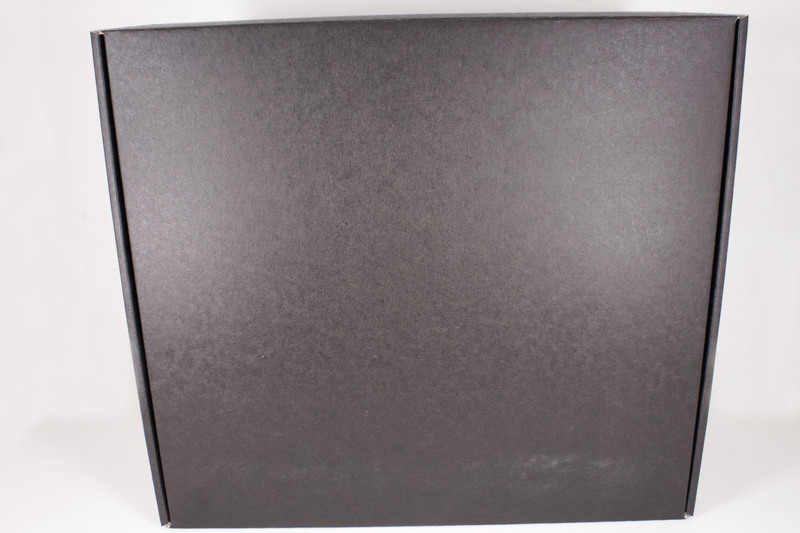 EVGA’s box style is the classic all black with the name of the motherboard in 3D lettering. Trailing off from the name is what looks like traces. There is very little on the box besides that. As we were not sent a retail box kit we do not have pictures of the actual box here. We grabbed these images off of EVGA’s website so that we had something to show. Another item that was missing from our package was the manual and drivers DVD (again the picture you see here is from the website). We ended up grabbing all of the drivers from EVGA’s website so we will not be able to talk to you about the installer used or any of the utilities that might be included with this board. Inside the box that was sent to use we did have all of the accessories that you would get with the X79 FTW though. The Goodies include SATA cables, a USB/Firewire bracket, a USB 3.0 bracket, Molex to SATA power cables, an IO Shield and three SLI bridges. Two of these bridges were for three-way SLI. One looked like it was for standard three-way SLI and the other had a large gap between the second and third card. This was a little odd, but could be so that you could throw in another card for PhysX (there is a mention of this configuration in the manual which is not a bad touch. The layout of any motherboard is important. Even simple mistakes in component placement or the signal traces can cause major issued in performance and stability. With the ATX form factor we find that this is even truer; the devices we drop onto them demand more and cleaner power while the signal speeds push faster and faster The EVGA X79 FTW is a very nice looking board. Thanks to the use of their matte black PCB and the way they coat their traces it gives the FTW a very clean look. Aside from that EVGA has used POSCAPs on the board these replace the cylindrical, solid caps that we have seen on other products. POSCAPs are solid electrolytic chip style polymer capacitors where the Anode is typically a Tantalum and the Cathode is the Polymer. They are similar to MSI’s Hi-C Caps (which are “Highly-Concudtive” Polymer Capacitors). These types of capacitors do quite a bit (in addition to giving the board a clean look). They can endure more heat, higher current and product less electronic noise. 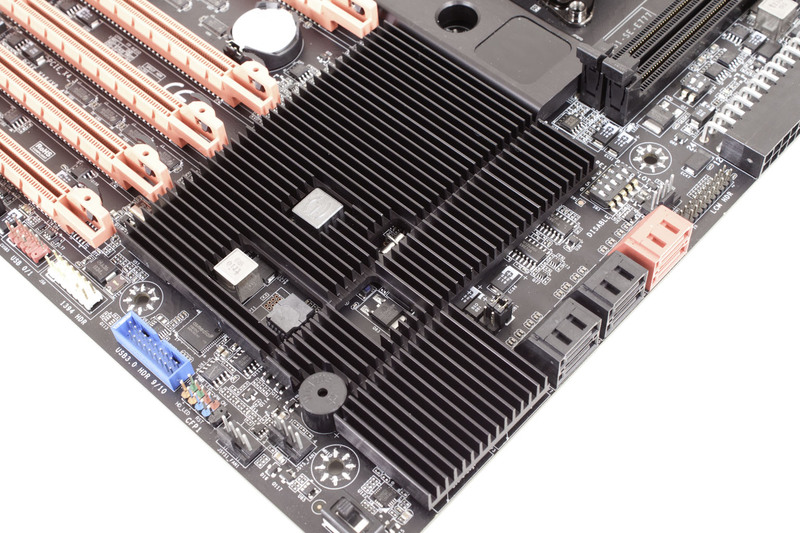 In other words, they (if applied properly) can improve the overall performance of the board and its ability to overclock. 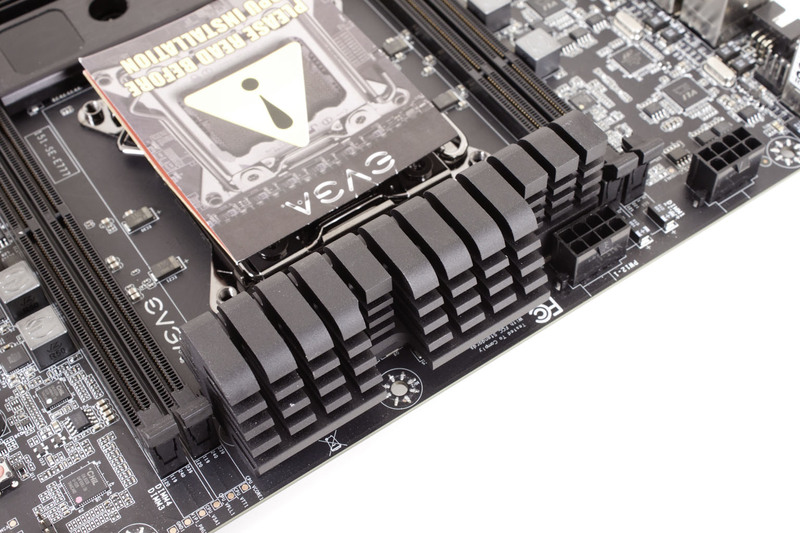 As we mentioned EVGA is not the first company to use Polymer Capacitors, but they are possibly the first to use them across the entire motherboard. Normally these caps are used around the CPU and as part of the power regulation design. EVGA has gone farther and put them across the entire board. We are looking forward to seeing if and how they do affect performance and in particular overclocking. Moving back to the layout there are some other items of interest. 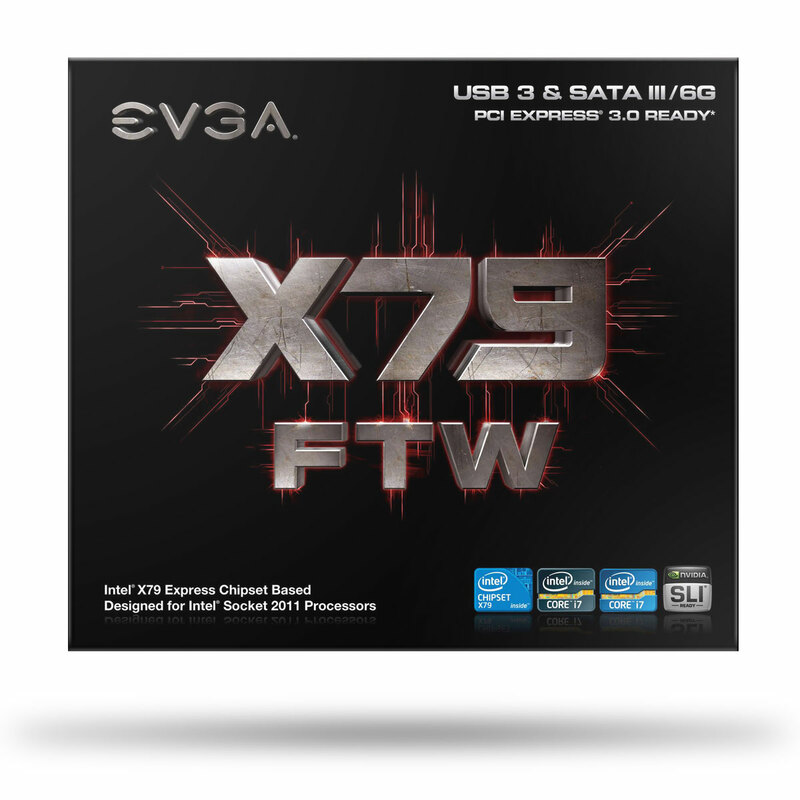 The X79 FTW appears to be a slightly wider ATX design (nothing new), but EVGA has added some items in such as the 90-degree angled 24-pin ATX power connector. This is a nice touch and will let you flatten you power cable to help with air flow. Right above this we find the power and reset buttons (again nothing amazing, but still nice). 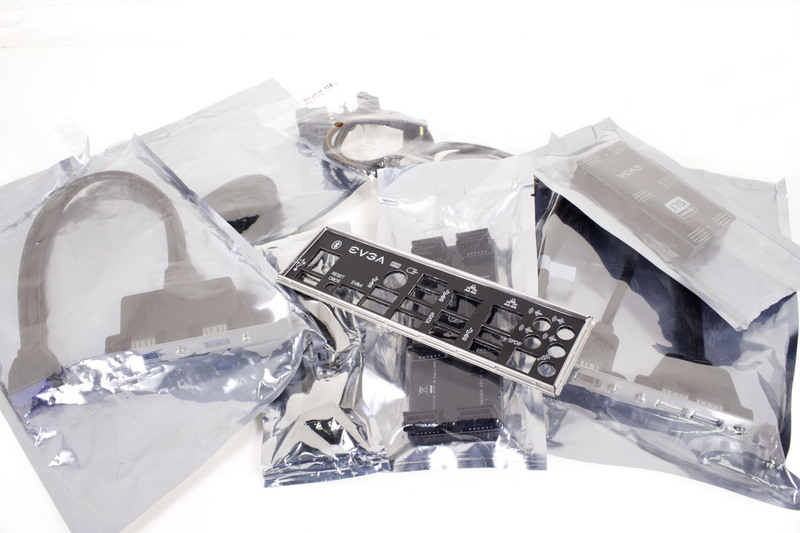 EVGA has thrown in quite a few 4-pin fan headers to make sure you can keep things cool. Touching on the power regulation again, EVGA has added in a very hefty heatsink to help keep things cool. This will work out very well as long as you have good air flow through this area (nothing that you would not already know). We were a little disappointed with the placement of the dual 8-pin aux power connectors though. The primary is extremely close to the VRM heatsink so we highly recommend an adapter for here. In the shot below we want to point out the small square chips labeled VLI, these are VIA USB 3.0 hubs that allow you to take a single USB connection and turn it into four. We counted two of these back here which explains the number of USB 3.0 ports on the I/O panel. 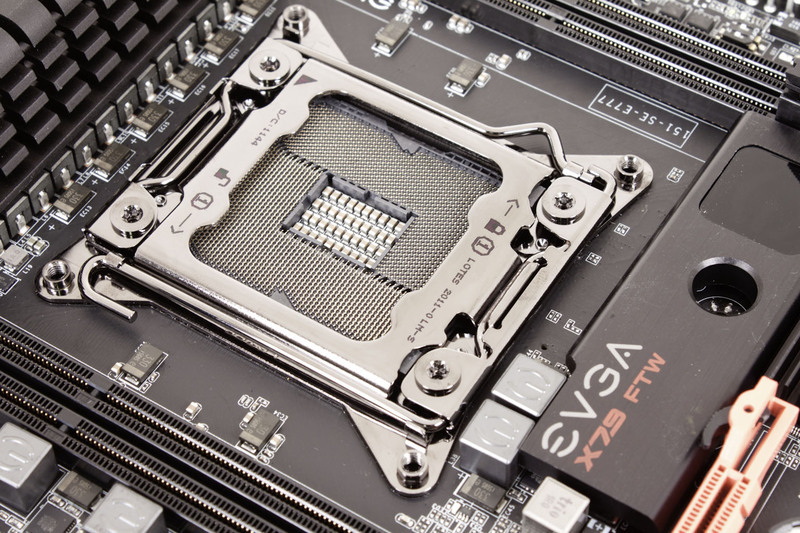 The EVGA X79 FTW has five x16 mechanical slots that are all wired to be x16 electrical as well. Do not count on getting three-way SLI at x16 though, as the slots will drop back to x8 once you start populating multiple slots. At fill three-way SLI you will get x8 on x16 slots 1 and 2 and x16 on slot four. If you go for three-way SLI plus one extra GPU for PhysX you will get x8 on all four cards. In keeping with the overclocking potential of the board EVGA also dropped in a very large (and very nice) heatsink. This will help keep not only the X79 MCP cool, but also other important components on the board. If you look closely you can also see a back of small dip-switches. These are to enable or disable the PCIe x16 slots; doing this can increase your stability as it reduces the power needed along with other system resources. EVGA also has a BIOS switch that lets you select which BIOS you are using when you power up the board. This is nice if you want to maintain two sets of performance parameters, but is not really anything new to be honest. Flipping around to the I/O panel we find a total of 8 USB 3.0 ports (here is where the VLI Hubs come into play) along with two USB 2.0 ports, two eSATA ports, two GBe LAN ports, a PS/2 port, your typical audio outputs, another one of those clear CMOS buttons, an accessory port and a Bluetooth module. Not bad at all really. Now this list might not look like much, but it actually is. 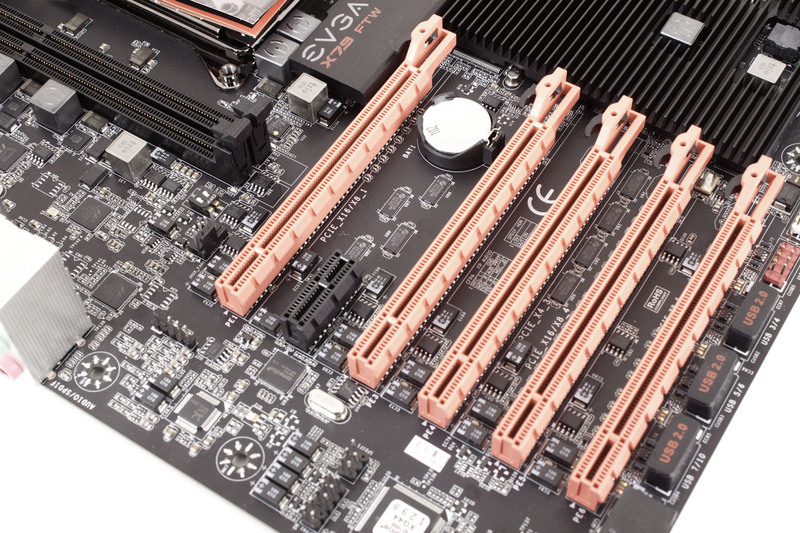 As we mentioned above EVGA is the only board that we have seen that has ALL polymer CAPs. We have seen them replace the majority of caps in the voltage regulation design, but never the entire board. It is very look looking to see though. The PCIe kill switches are not unique, but they are not all that common and will be a big deal to the overclockers and benchmarkers out there. 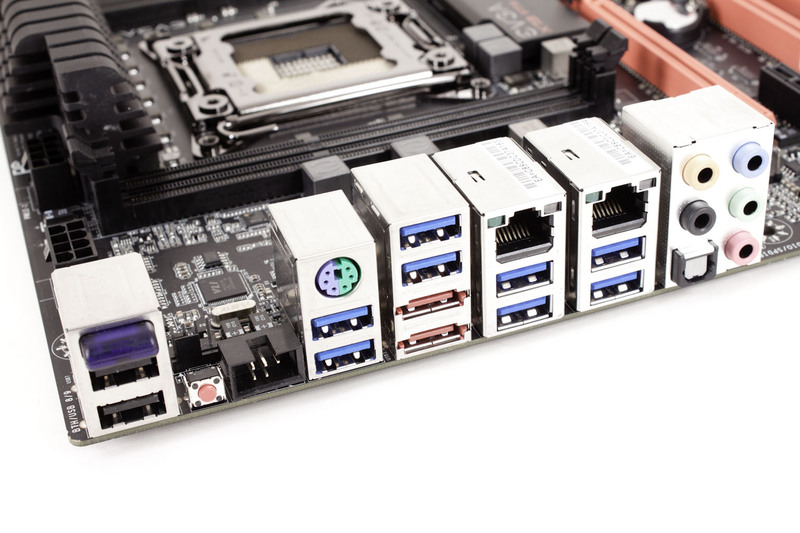 The addition of a three-way SLI bridge that allows for a smaller GPU to be used for PhysX is a very cool option for gamers looking to grab that edge while the extra USB 3.0 ports on the I/O panel just round things out. This list is very specific to the enthusiasts and benchmarkers. If you are running everything on an open test bench then you want easy to reach buttons on the board just as you will want more power to the CPU and PCIe slots for better overclocking and benchmarking at those speeds. The tilting of the power connector falls into an enthusiast want as it helps keep your case clean and reduces air blockage. 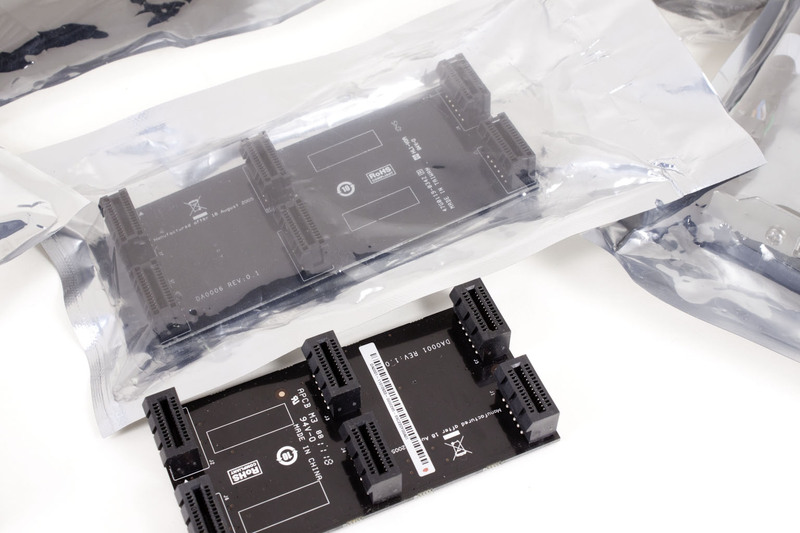 The floor mats are just that, you can expect these from other X79 boards as well as boards with different chipsets. They might help get you to buy the X79 FTW, but if they do you were already leaning towards it very heavily. Bear in mind that this is not everything that the EVGA X79 FTW has as an option or a feature. It is just a listing of the ones that stand out and/or are already used as markerting items. We could spend quite a while listing everything that the X79 FTW has as a "feature" but that would get boring pretty fast. So far we have to say that we are impressed with some of the design choices that EVGA has made. The move to all polymer caps cannot be overlooked as it can improve the boards overclocking potential dramatically by reducing heat and electronic noise on the board. Other items that come into play as we move to the performance phase of our review are the multiple PCIe x16 slots (and their kill switches) we are going to play around with this once we find our max stable OC to see if shutting them down will help us push higher. We are also very hopeful that we will be able to test this with three-way SLI both stock and overclocked to see what kind of score we can publish. For now we are very intrigued and are looking forward to pushing this board through our battery of tests and beyond. Check back soon for our coverage of how the EVGA X79 FTW performs and what scores we can get when we load it up. Check out our video coverage of the design and features as well.